Increasing population and internet penetration along with increasing business car rental due to consistent bookings from corporate customers to attend events such as exhibitions, conferences, workshops and meetings projects has driven the growth of car rental and leasing market in South Africa. South Africa Car Rental and Leasing market augmented positively from 2013 to 2018 at a positive CAGR during the review period 2013-2018. The car rental and leasing market was largely dominated by foreign companies operating in the country including Avis, Hertz, Budget and Europcar. Car rental and leasing market in South Africa was driven by business car rental due to consistent bookings from corporate customers to attend events such as exhibitions, conferences, workshops and meetings. Industry players also formed strategic partnerships with each other to boost sales. In 2013, online cab aggregators entered the South African transportation industry with the launch of Uber in Johannesburg. 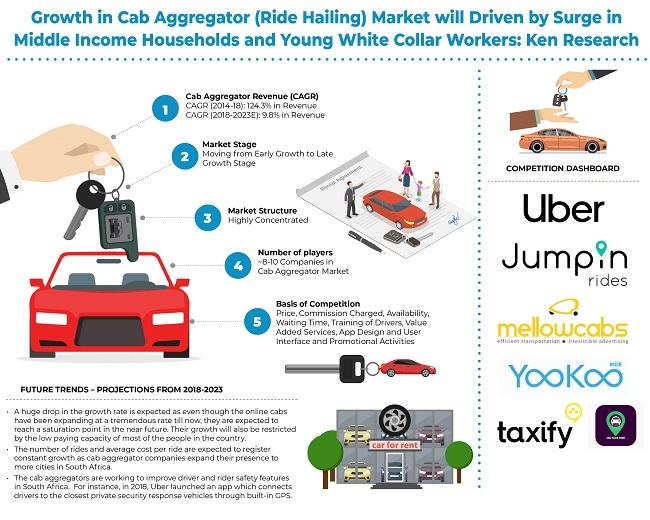 Uber and Taxify are the major players in the cab aggregator market. At numerous occasions, violence has erupted between metered taxi operators and online cab aggregator drivers in the country as the metered taxi operators accused the online cab aggregators of stealing business and competing unfairly due to low fares which could not be matched. Analysts at Ken Research in their latest publication “South Africa Car Rental and Leasing Market Projections to 2023 – By Business Model (Self Drive, Cab Aggregator, Car Leasing, Minibus Taxi, Metered Taxi and Airport Transfers) and By End User (Mining, Logistic & Courier and Others)” believe that greater flexibility in car hiring system by corporate booking and long term leasing services companies, strict implementation of rules for governing taxi market, better access to internet services at reasonable rate, promotion of ride sharing, provision of more value added services, improvement in driver and rider safety and tie- ups and collaborations between different companies will aid the car rental and leasing companies and cab aggregators to grow and achieve higher profits. South Africa Car Rental and Leasing market is highly concentrated with the presence of few big players constituting majority of the market. The major competition parameters are price, fleet variations, value added services offered, age of the car and ease of availability. A major reason for increase in car rental and leasing market will be utilization of rental and leased vehicles for executing jobs in app based taxi market. Hence, as the online cab aggregators market expands, it will also increase the demand for car rental and leasing market. The roll-out programme for e-Visas in South Africa along with the low valuation of rand should make South Africa a thriving tourist destination for foreign travelers in the future, thus expanding the car rental industry too. Moreover, businesses such as renting a car on per day basis to professional drivers for use as a commercial purpose such as using it for ferrying tourists or for using it to fulfill short term needs of other companies is expected to increase the revenues of car rental and leasing companies in the future.